America tennis superstar Serena Williams don gbab fine of $17,000 on top three offence wey she do for di 2018 US Open final, according to di United States Tennis Association (USTA). During Saturday match wey she lose 6-2 6-4 to Japan Naomi Osaka, she chop coaching offense, den anoda offence wen she break her bat and di final one wen she begin drag wit match referee Carlos Ramos. 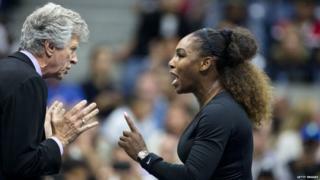 Serena wey dey wan break record wit her number 24 Grand Slam title, bin get big kwanta wit di referee Ramos during di match sotey she call am 'liar' and 'tiff'. She even tok say make Ramos tell am sorry afta im bin tok say she dey collect coaching advice as di game dey happun.